I think I after this magnet, I have one more chocolate miniatures magnet left to go. And then I might have to head back over to Hershey (either Pennsylvania, or you know, Times Square) to see what new magnets they might have. Man, I used to hate when my dad would buy Hershey's Miniatures. Sounds crazy, no? Why hate those bags of chocolatey goodness? It's because they were the hardest bags to eat at my house. First, everyone ransacked the bag for their favorites - usually the Krackel, and then Mr. Goodbar. Then, when pickings were slim (or you weren't fast enough), we'd go for the regular milk chocolate. Finally, when all the other kinds were gone and we were just left with a bag of Special Dark - and it's been determined that there wasn't another bag of chocolate somewhere in hiding - then, we'd eat that last bunch of chocolates. And? It always felt like they made more of the Special Darks, versus all the other flavors! Ugh! What, it took me a while to appreciate dark chocolate! Why'd I pick this magnet for today? It was the first title that came to mind, when this post was gonna be all about how I saw pretty Matt Bomer and the cast of White Collar last night at the Paley Center. Then I actually looked up the movie, and if Matt resembles Mr. Goodbar. Uhhh, yeah, thank goodness I looked it up! 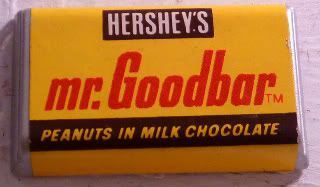 Mr. Goodbar and Krackel were so much better than the plain ones of either variety. They should make bags of just those two. The world would be a crunchier place.